Yes, critical thinking and religion are not mutually exclusive when the former is applied to the latter, but they are mutually exclusive when the latter is applied to the former! And the reason for this is rather simple: each uses an way of thinking – an epistemology – that are incompatible. Whereas both critical thinking and religious belief assumes the use of justified true beliefs, what constitutes how justification is established are contrary. Critical thinking demands that evidence from an independent reality be adduced from it to justify a knowledge claim made about it. They are connected. Religious belief demands that evidence from reality be carefully selected to support an a priori set of faith tenets so that the conclusion of justification can be determined from groomed premises and imposed back on reality as if this tactic allows us to then deduce the religious tenets from it. Every religion seems to do this (which may help us understand why we end up with tens of thousands of different religions, each presenting itself as the One True Belief.). Reality and faith-based beliefs about it are thus disconnected. This is why CS has such difficulty recognizing that faith healing, for example, doesn’t work as a causal effect claimed to be justified if we allow reality rather than faith-based belief about it to arbitrate. This approach kills real people in real life needlessly and we see examples of this on a regular basis, seemingly to no effect on those who assume faith healing is justified by their religious belief rather than accept reality’s arbitration of it as unjustified. I am glad religious belief makes you uncomfortable because with more study you’ll find it is a way of knowing nothing about anything while people fool themselves into thinking such glorified ignorance is a virtue. And no one would care… if it didn’t cause real harm to real people in real life and, all too often, dependent children who have no choice in the woo their parents embrace. Just touching on one point in the guest editorial. About having CS talked about and talked about until a person finds he or she is hooked into the belief system. Perhaps talking was the experience of the writer. That talking would be a good thing. 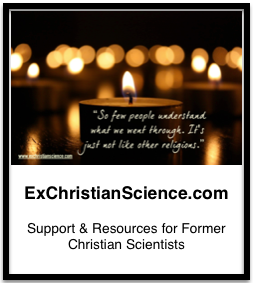 It seems to me, with a few exceptions, that not enough “talking and talking” is done within Christian Science when someone is considering belonging to the Christian Science group. Instead, a person he handed books and articles to read to absorb. I wish there was more of a talking through the concepts approach. For example, I didn’t ask every single kid or student that visited my Sunday School class. However, I asked many students if they ever met and talked with a practitioner. The reply was “no.” They didn’t even know who was a practitioner to have a conversation. What a thoughtful and well-articulated piece! If Prin taught you to think and write like that, Vicomte, then they are at least doing something right. I hope they keep it up, because they will succeed in helping even more students free themselves from the irrationality of Christian Science. I agree that religions generally discourage individual reasoning (to varying degrees) in favor of belief. In Christianity that goes back at least to St. Paul, who emphasized faith as the path to salvation, rather than reason. Christian Science is no exception, as you so ably point out, even though it purports to encourage thinking. In fact, CS has very effective mechanisms in place to discourage individual rational thought. One is community isolation. Another is the teaching that objective sensory evidence is a lie. And then there is the inculcated fear that animal magnetism, mesmerism, or hypnotism is the source of thoughts (suggestions) that run counter to Christian Science belief. You are taught to police your own thoughts (stand porter), and it seems to work quite well. When I was a sheep at Prin in the 70s, there was a brief period when I started to express some rational challenges to the culture. But a sheepdog took me aside and explained that I was “being handled.” Well, that worked, and like a good little lamb, I returned to the fold. Thank you! I really appreciate the kind words, While I was fortunate to have a strong writing foundation already in place before attending Prin (I’m convinced I had the world’s best writing teacher my sophomore year of high school), Prin afforded me plentiful opportunities to build on that foundation, which put me on a path to actually making a living as a writer today. You may find it interesting (I certainly did) that some of the Prin classes I valued the most highly and learned the most from were the ones that ultimately led me to move away from CS–in particular, I recall, a class on philosophy and religion. Many of the references in this article (Augustine, Ireneaus, and Kierkegaard, for starters) first came to my attention in that class, and it was there that I first started to articulate my ideas about individual thought and its place (or lack thereof) in CS. That class taught me an immense respect for those who feel able to approach, support, and defend their faith through reason–and sadly, just as immense a disrespect for those who refuse even to attempt to join the two.